AMI was responsible for ensuring overall environmental quality control, regulatory compliance, and health and safety procedures during work activities. To coordinate with the sequencing of new construction, demolition (interior and exterior) and abatement had to be performed in two phases, requiring multiple mobilizations. Prior to this renewal project, Paxton Manor sat vacant for three years and was last used as subsidized housing for the elderly and mentally ill. 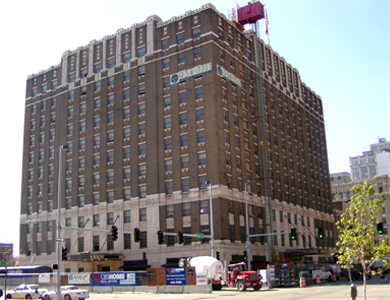 Although the building has been home to a variety of businesses, the original structure, the Paxton Hotel, was built in 1929. The building has 11 stories, 165,000 square feet and is a significant example of art deco architecture. Initially, AMI Environmental (AMI) was selected to perform a Phase I Environmental Site Assessment to characterize existing environmental conditions and to assess potential environmental concerns caused by activities on this property, as well as the excavated adjoining lot. Upon completion of the Phase I and other feasibility studies, the client decided to move forward with the renewal project and develop the site into luxury condominiums. A full site investigation was completed to identify and quantify the presence of hazardous materials within the facility that could be disrupted as a result of the renewal project. Numerous samples were taken and analyzed to determine levels of asbestos, lead-based paint, lead, mercury, freon and mold. The remediation phase of the project entailed the removal and disposal of all hazardous materials and the demolition of interior/exterior building materials to facilitate the safe renewal of the Paxton.